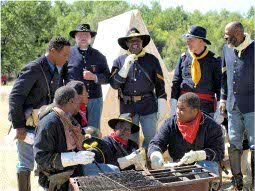 The unit has done historical presentations with artifacts for schools, clubs and organizations. Historical presentations that the unit provides are authentic to the era. 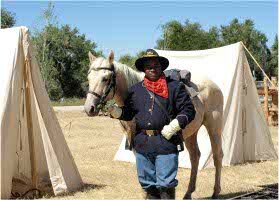 All are presented in a historically accurate context with role playing, an artifact display, and photographs. Upon request, Manual of Arms, Mounted Exercises, and Saber Drills are available. The unit has performed for area civic organizations, at the Air Force Academy, at Denver, Aurora, and Adams County schools. 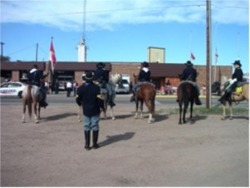 An outstanding 4 man team participates in mounted drill team maneuvers. 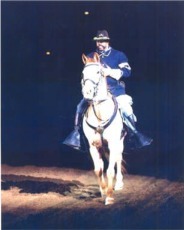 The drills depict the horsemanship skills a cavalry needed in combat. The saber drills simulate those used by the United States military units of the late 1800’s. The executed offensive and defensive mounted saber drills are exciting. The mounted saber charge is one of a kind. Using authentic Sharp, Spencer, black powder ball and cap and the later, Springfield converted shell cartridge weapons, the unit’s troopers perform manual arms drills. Troopers explain the purpose of each to the audience. The audience becomes a part of history with the skirmish line. The maneuver simulates the order and methods troops used on the firing line during combat. 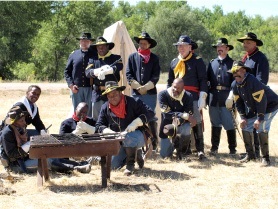 These are just a few of the many performances given by the Buffalo Soldiers. 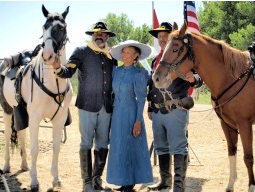 While the Buffalo Soldiers of the American West is Colorado-based, they have been providing authentic historical entertainment throughout the U.S. for over 20 years.